Be quick! The Bundle of Holding has re-released its Bundle of FATE, an offer good for another 4 days or so. Also this could be your last chance to look at Starblazer Adventures and Legends of Anglerre from Cubicle 7, as the license is about to lapse. That’s a lot of FATE. This is a free game, it’s easy to learn, it’s from the UK Roleplayers Design Collective. Good introduction to FATE concepts. Interesting for its iPad-specific layout (an “enhanced PDF”). Obviously competing with Eclipse Phase for the Transhuman crown, possibly more digestible, and nice to see someone doing something cool with the electronic format. Roots in both FATE Core and Voidstar’s own Strands of FATE. I’ve mentioned my Wild Talents version before. This is the same great game in what’s probably a better overall package (it’s self-contained, for one thing). FATE Core and Accelerated are pay what you want, and Free FATE is, well, free. 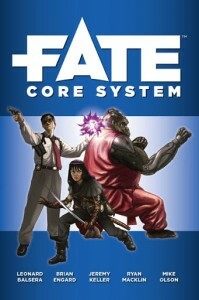 But of course, the FATE Core is included in the Bundle, which is both a bargain and supporting a good cause. The FATE Core SRD is online, too. This one [Steven’s Balagan] talks about the differences between FATE 2.0 and 3.0. Why Pay For Free Stuff? I’ve been anticipating a deeper look at FATE for a while, although I’ve not had time to digest the contents of the bundle yet. FATE is sort-of the Linux of RPGs. It has very specific moving parts, and it has loads of forks where the designers have put the moving parts in subtly different locations. And of course, it’s free. That begs the question, what are you paying for in Spirit of the Century that you don’t get in FATE Core? First, you get a complete package for pulp-genre play. This includes examples to put the game into pulp context, as well as a compelling backdrop (the Century Club) and the “novelisation” of the characters. I love all of that, and I don’t really like pulp. Second, I felt I got a lot more hand-holding, advice, and a sense of how the game is supposed to be played. But, I have read SotC much more recently than FATE Core. Overall I preferred SotC as an introduction to FATE, and I felt the Core was a bit sterile. On the other hand I like the Core’s workflows and toolkit approach. Similarly the Kerberos Club marries FATE with the concept of superheroic Archetypes from Wild Talents (a part of that system I actually like), adding examples of Aspects and when to Invoke them. Last Words: It’s all FATE, right? When the system is basically the same, products are differentiated on usability. I approve of this wholeheartedly. I’m a big fan of the Open Game License, too. It gets us away from me-too systems and focuses effort on doing creative things with games. I don’t really want to call [FATE Core] rules-light. It’s really more rules-medium, with a very different focus than what we’re accustomed to as gamers. Properly done, Fate Points should really be flying across the table left and right. Anyway, if you’re reading this in time, check out the Bundle of Holding!